Estilo's power coupling, food birthdays + more. Scott Elmquist Estilo’s Josh and Jessica Bufford with Owen Lane of the Magpie. Some of the dining scene’s secrets are so poorly kept that when the news officially breaks, the size of the eye roll is the most significant aspect of the information. Then there’s news that takes you completely by surprise. Take Estilo, for instance. 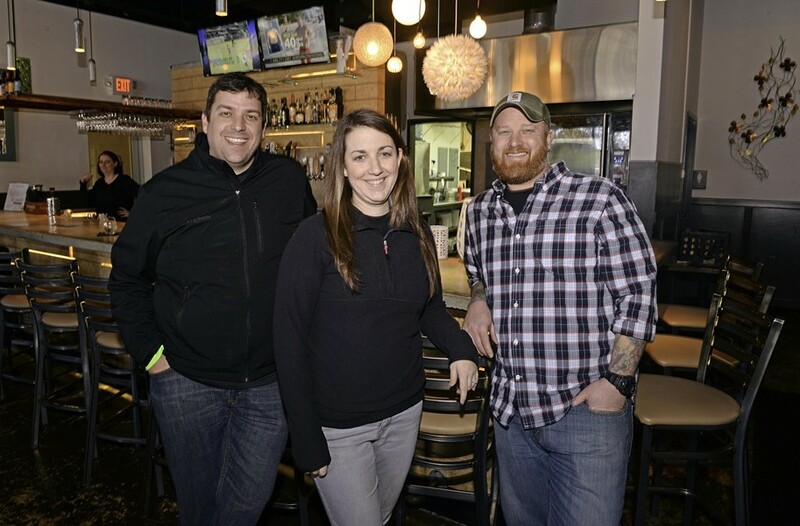 The winner of the 2014 Elby for best new restaurant, Estilo, owned by Jessica and Josh Bufford, sits by sister restaurant, Toast, in the West End’s Village Shopping Center. Its menu is a romp through Latin American street food — from Peruvian rotisserie chicken to Mexican chicken tinga. Missing from the menu is information about the owners’ exceptional ability to play their cards close to their chest. The news? Owen Lane, Magpie chef and co-owner with his wife, Tiffany Gellner, has become the Buffords’ new partner. Lane is working to rewrite the menu and revamp Estilo’s kitchen. The type of cuisine isn’t going to change, but all of the dishes that the restaurant currently serves will. Estilo will close after dinner this Saturday, Jan. 17, and reopen Jan. 26. How did this unusual move come about? Lane served an inspiring Latin-American-based menu to celebrate the Magpie’s third anniversary last year — and the Buffords were impressed. “It was exactly what we wanted to be doing [at Estilo],” he says. They’d become good friends with Lane and Gellner through the years. In November, the Buffords decided to ask the question. “I had kind of a gut feeling at that point that he was going to spring something on me,” Lane says. It didn’t take long for the restaurant owners to reach an agreement. To succeed in the business, spending the rest of your life behind the line isn’t viable. Lane was moving in that direction already, pulling back a bit from the day-to-day at the Magpie. The partnership also will extend the Magpie’s reach. As a sister restaurant, there will be opportunities for cross-promotion. And it’ll stretch the creativity of both restaurants’ staff. “It’s a chance for guys just starting out or that have been in the business for four or five years to try new things,” he says. There’s another reason to partner. The Buffords expect their first child in the summer. And that’s also why they decided to close West Franklin Street’s Dash Kitchen and Carry. “It was part of the bigger plan,” he says. “We needed to pull some talent back from there and focus on bets we believed would be bigger in the new year.” The Buffords also announced on Friday they will open Hutch restaurant in the old Eurasia space. At Estilo, Lane will spend most of his time at the start getting the revamped restaurant running smoothly, but later, the plan is for him to spend half the week behind the stove there and the other half at the Magpie. He’s confident in his longtime staff at the Magpie. “At some point you have to [realize] they’re perfectly capable of doing things on their own,” he says, laughing. Tough times: It’s been a rough transition to 2015 for some area restaurants. Virginia Commonwealth University’s location of Big’s BBQ closed, Sweetopia locked its doors, and Haiku, in Shockoe Bottom, is no more. On a brighter note: Buddy’s Place closed in the Fan but will reopen in the Devil’s Triangle on Thursday, Jan. 15. High mark: Positive Vibe Café will celebrate its 10th anniversary with 850 graduates of its restaurant food service training program for people with disabilities Jan. 17 — and you’re invited. The party starts at 6 p.m., with performances from the Taters, Andy Vaughan and the Driveline, and the Hullabaloos. positiveviberva.com. Happy birthday to you, too: In the Short Order column published Dec. 31, “Feeding Frenzy,” several anniversaries were overlooked. Rostov’s Coffee and Tea turned 35, Millie’s Diner turned 25 and Buckhead’s Chop House turned 20. I’m sure there are others that fell into an obscure part of my brain during 2014 — please email shortorder@styleweekly.com and let me wish you a happy birthday!